The great warrior Groundimus Hogg adventures far and wide, searching for the Shadow Demon's lair. The Shadow Demon has cursed the land with never ending snow and ice. 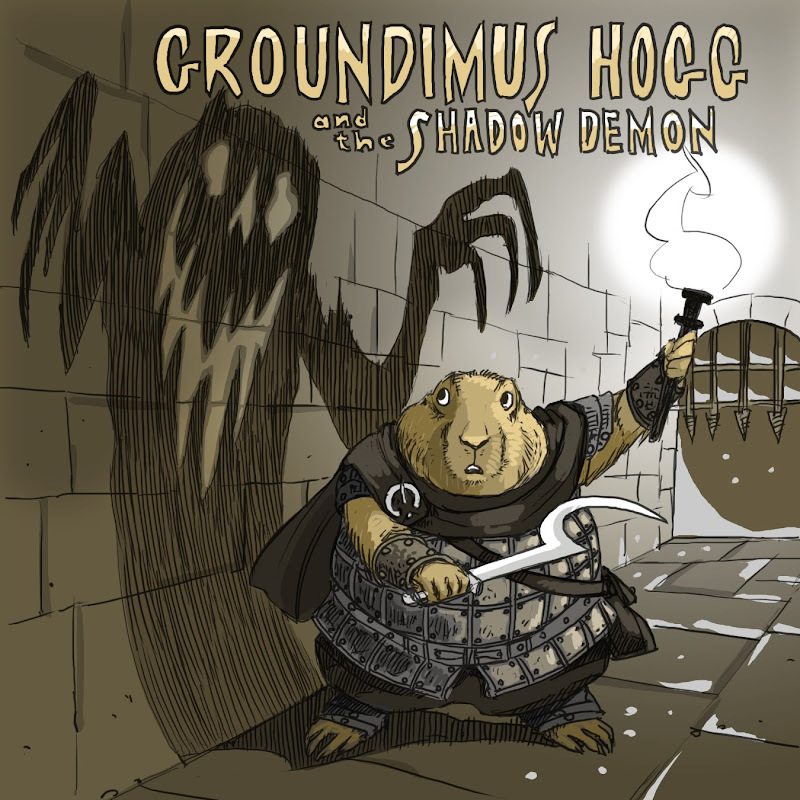 But what Groundimus Hogg doesn't know is that he, himself, is responsible for creating the Shadow Demon! Yeah, yesterday was Groundhog Day, so I should have posted this then. A few years back there were about nine thousand books titled: "Namicus Name and the Thingy Thing." But were any of them an epic retelling of Groundhog Day? I don't think so. I should have pitched this book in 2004, I would have made millions! I just want to give him a hug. You may just have ousted Vampoline as my favourite of your picture books. I need to read this. I do. How does he win? I have to know how this ends. What does Groundimus Hogg do? Well, it can only end one of two ways. Either he defeats the Shadow Demon, or the endless winter continues. Or, wait, how does Groundhog Day work again? I'll have to do some research. Love the look of the groundhog. He reminds me of Sullivan from "The Secrets of Nimh," the rat that is second to Jenner. I've seen some "quiet" books themed to this holiday...this one will immediately be grabbed up by the boys! I'd probably read Namicus Name and the Thingy Thing too, just so you know. Just so you know the LOTR reference is well appreciated. At some point Groundimus needs to say "Down here, it's our time. It's our time down here." Or perhaps "share the load" in slo-mo. Put me down for a pre-order.